A lot of people are martyrs and want to get their hands in the dirt and design their own WordPress Theme from scratch. That’s okay. I did that, and then got smarter. Let’s start with the smarter choice. First, find a WordPress Theme architecture that you like, be it one or two sidebars, or no header, or whatever you want. Forget about the colors, graphics, and fonts. Just concentrate on the layout. If nothing pleases you, then I recommend you try the new Sandbox Theme, another great way to start your WordPress Theme from scratch. Download a couple of Themes you like and put them through their paces on your test site. Do you like the way the single post looks different from the front page, category, and archive pages? If not, try another. If yes, then it’s time to start to work. Copy your chosen Theme to a new folder with a different folder name under your wp-content/themes folder. Open the style.css style sheet file in a Text Editor and rename the header section at the top to something different, like “My Test Theme” or “Ripping and Tearing”. Just give it a different name. Depending upon how much you will end up modifying the Theme, you can either leave the author credit inside or not, it’s up to you and the copyright terms of the WordPress Theme. Upload the new Theme Folder to your website. From within the Administration Panels, under Presentation, find the new Theme and activate it. You now have a test Theme to work with. If you aren’t worried about bandwidth on your website or your Internet connection, you can style your site right on the Internet. If you are worried, then use the “Sandbox” method. Get familiar with your site’s layout and structure by checking the source code and the style sheet, and begin your modifications one at a time. I recommend that you backup your test Theme folder frequently as you go, in case you make a big mess and you need to go back, but not to start over. If you are determined to redesign your WordPress Theme from scratch, you probably already know how to do this. Still, I’m here to help WordPress users and so here are some things you need to know if you are going to design your WordPress Theme from scratch. One of the best tools recently developed for web page designers is found in the Firefox Internet Browser. Called the Firefox Web Developer Extension, it allows amazing WYSIWYG on the screen live editing of the style sheets of any web page. And a whole lot more. You can learn more about how to use this to style your WordPress Themes and find your problem CSS troublemakers in the article here on The Secret of Successful Editing of WordPress Themes. You will also need a good text editor to edit the WordPress Templates. For a list of those recommended by WordPress users, see Text Editors in the WordPress Codex. 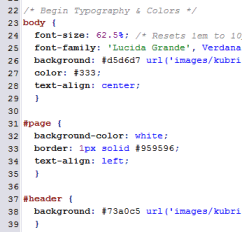 Also, seriously consider using the “Sandbox” method for designing your style sheet and Theme. Here is a very simple step-by-step process to start to design your own WordPress Theme from scratch. Using either the Default or Classic WordPress Themes, generate a test post in your browser. Copy the ID and class selectors and HTML tags from the top to the bottom of the site into a Text Editor page. This is the list of the architectural features you can change, also known as your style sheet. You can also find a fairly complete listing of all the styles in most WordPress Themes on the WordPress Codex in Site Architecture 1.5. If necessary, add selectors to the sections lacking them, like each of the template tags that generate different lists within the sidebar and/or footer. These need to be added to the various modular template files within the test Theme folder. Different tags may appear on different views of your test Theme. Be sure and check the pages generated by the front page, category, archives, search, single, and Page views to find more selectors and tags. When you have your list finished, then save it and call it style.css, replacing the style sheet that came with the Theme. Start applying styles to the various structural HTML tags, ID and class selectors within the style.css. Here is a list of articles and resources you may find helpful when designing your WordPress Theme, from scratch or just for tweaking. 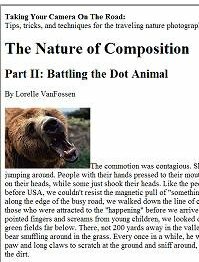 This entry was written by Lorelle VanFossen and posted on September 28, 2005 at 5:22 pm and filed under Web Design, WordPress, WordPress Themes, WordPress Tips with tags css, design, design tips, how to use wordpress, html, Web Design, wordpress, wordpress help, WordPress Themes, WordPress Tips, wordpress tutorials. Bookmark the permalink. Follow any comments here with the RSS feed for this post. Post a comment or leave a trackback: Trackback URL. There’s a title, but no href. This post helps a lot… Thanks! I’m currently setting up a new site using wordpress software. This is exactly what I’m looking for in helping me start from scratch (or working with the tweaking, but even starting from scratch is more useful to understand functions). Great post, it’ll be very helpful! Its not that hard to do, I matched my site design with a custom made template in about an hour. I really dont know why the default themes are so complicated! From what people have said to me it puts them off wordpress :S It certainly used to confuse the hell out of me! I am already in the process of developing my own custom WordPress theme so your resource list sure is going to come in handy. Bookmarked straight away for future reference. An excellent resource, thanks Lorelle! If those new to theming are looking for great color schemes and swatches, might want to check out Adobe Kuler. It’s free, easy, and you can make it generate some incredible complementary color combinations. I found a detailed video tutorial on how to use Kuler you might want to read. Thanks, I was looking for something like this. I’ll post again if I manage to get around to it. I was over at WP site and couldn’t find any themes, is there any WP themes viewer any where?! WordPress Themes are found on the WordPress Theme Viewer. Hey I did a search for this very subject and found you. Great site BTW. I’m looking for a nice foundation for a three column layout. Is there any I could find that do not have tons of code I need to sift through. I’m really looking for the foundation bare nakid code with no other styling other than whats needed for wordpress to work so I could make a clean design. All right then … can anyone tell me please, how can I get content from themes.wordpress.net ? I’m working at this moment on my theme but how can I be sure that I did all styles. I’m not sure I understand your question. To download a Theme from the Themes Viewer, simply download it. To check to see if you styled everything you want styled, and not everything needs to be styled, look. Check out the design yourself to see if each of the various page views “look” like you want them to look. Thank you so much – I’ve been looking for this info for days (just goes to show how great Google search really is), and I’ve made a complete mess of editing my theme. I’d almost given up on the idea of being able to have a decent wordpress theme ever. Now, I’m going to print out your instructions. Thank you. Creating individual Pages is the most interesting from all this … Thanks. can i do it for blogger also? It’s HTML. It will work with anything web design. This was a very helpful tutorial. Really appreciate you taking the time to share this information with new wp designers. I want to thank you for being such a valuable resource for WordPress tips, especially with the many tips and links on how to create a theme for your blog. I just created my first WordPress theme, and what I’ve read here (and linked to from here) was very helpful. My theme is not great, I’m no graphic artist or professional designer, but I am feeling very satisfied for having done it myself. Does anybody know if there is a way to integrate JEDIT into firefox CSS Editor. That way you would get the visual beauty of JEDIT combined with “on the fly” CSS editing add-on of firefox. i need it ………… !! as usual, great article man. Now i have so much reference for wordpress. I’m newbie with wordpress. Please see my blog and give your comment about my blog. Can I add my shameless plug? I designed a plugin for Dreamweaver that ‘enlightens Dw’ about how to render WordPress theme template tags. The result is a WYSIWYG Design View for WordPress themes. You can navigate code visually just by clicking in Design View. Its a lightweight extension, works offline, no server needed. It also provides code hints in Dw’s Code View. Its great for making minute changes without having to go rounds with a server. Reflects CSS changes and most template tag parameters instantly in Design View. Since Design View is just a layout approximation it doesn’t beat a server+browser but it sure is faster to get stuff done. ‘specially for those that are visual like me! thanks so much fr awesome post. finally, i found what i looking for in here! You should be more explicative. I found a blog from witch i made everything myself. Every last word. It§s a good ideea you made but not enough. Thanks for a really helpful tips. I appreciate that. Wow, I love reading your blog, it’s so full of wonderful information, and for a ignorant fool like me, it’s a major help. Thanks! Thanks, i’ve spent a fair while trying to find something like this. Would have saved me a lot of time if i had found this earlier.. pff, ahwell =]. I posted on your Sandbox page site my recommendation for XAMPP to be used for locale testing. I wanted to recommend it here as well. Nice tutorial…very useful..Thanks a lot! For me, the decision of if I would create from scratch or modify one is dependant on ethics. I havent gotten any straight answer but what is the ethics behind modifying an existing template? Can you sell a template if it is modified from anothers? If so, what is the premise to determine if your template is too close to the original one you modified from? Ethics? If you create one from scratch, it’s yours, from top to bottom. No ethics involved. If you use a GPL WordPress Theme which permits modification, there are also no ethics involved – as long as you give credit where credit is due. If you totally change the entire WordPress Theme so it no longer resembles, in design and structure, the original, which is similar to starting from scratch, then a nod on your About Page is often enough to the original Theme designer. If you modify only a little and the core remains, attribution in the footer is standard and much appreciated by the original designer. The key is to give credit where credit is due, but WordPress Themes found within the WordPress Theme Directory are all under the GPL license and you can do with them what you will. Very nice post. WordPress design has also have somthing more which is more of coding and little tricky part. Hi Lorelle! I’ve read a lot of your articles and you are very informative, for which I (as well as many others, I’m sure) am very grateful! I was wondering if maybe you could help me with something quick/small as I’m not sure who to turn to… I’m basically teaching myself how to use wordpress, work with css sheets, etc…. I’m helping my friend by designing a site for her, but I want to match the white space around the body to the pink body background… I’ve been over the CSS several times over and am just not sure what to tweak… would you be able to let me know what I need to do? If you’re too busy, no worries… I just figured I’d ask. The term “BODY” is a CSS reference to the body HTML tag, so I assume you mean the space around the blog post content area. In the very messed up Theme, it would be the content class or one of the others within that category. There are some very old code styles and a lot of problems, like you are using Dreamweaver or worse. I don’t have time for specifics, so please check in with the WordPress Support Forum for free help you need to clean this up if you aren’t familiar with web design. Good luck. Yeah, I think that was a really messed up theme, so I’ve changed it to another theme. 🙂 Thank you for replying – I really appreciate it! Nice one, but I don’t like Sandbox which has too many useless functions. The Sandbox Theme is invaluable for those who need a powerful Theme as a blank canvas. There are tons around, and you can even build your own from scratch. A lot of options – too many options. Great information. I will definitely be trying it out on our main website blog. Seems easy enough to do which is great! I’m thinking of designing themes to create backlinks. An excellent resource, thanks Lorelle! Creating a Theme to create backlinks is a lousy reason. How about creating a Theme to give back to the community, to build credibility and establish reputation as a web designer, and for better reasons that that. I have wanted to turn one of my most visited websites into a Word Press Blog for quite some time. However I am intimidated because my website has a lot of pages. I really visualize it as a blog now though since when I started it websites were the way to go. Is there any place to find out how to get started on this? Export them from whatever blog platform you were using into your WordPress blog. It’s that easy. If you had a static HTML site, then things get more complicated. 😀 Copy and paste is my best recommendation then. Can i add that before anyone starts building a theme from scratch… take a look WordPress 2.8. It has a feature to see what your site would look like using the themes in the library or from any zip folder of a theme you have downloaded. If you want to learn how to build themes then that’s fine, but if you want a site up and running quickly and using a free fantastic theme… try themes in WordPress 2.8 or ant other free theme you like. Your methodology makes so much sense! Find a theme with a layout you like, then change everything else. Never thought of do it that way. Nice post, Thanks! Creating WordPress child themes using a theme framework such as Thematic is a really easy way to dive into the ocean of WordPress theme creation. This tutorial series is a good place to start. Lorelle, this is a great, albeit exhausting, list. I think a great thing for people to do is have a test WordPress site where they modify the CSS of others to see how it works and see the changes in a test environment. This will give them confidence as they design their own layouts. I am new user of Word press.I saw this article .I have to change my home page .I can try But i cant get it .I saw some another settings in this article.pls give me the procedure to upload External template. Please check the WordPress Codex, the online manual for WordPress Users, and the WordPress Support Forums for answers to this issue. You cannot just “upload an external template” to a WordPress Theme. It must be integrated into the Theme using WordPress code and template tags to generate the content. Nice post. I am working on a theme right now, and it is a bit confusing. Thank you. The best is to create your own template(s) by yourself instead copying and getting one from some websites, you’ll be more proud of what you have because it’s “your” creation. And then later, you’ll be able to share your own templates with others and the wp communauty. wow! really thanks! well some times the wp themes gives a lot of panic. is there any tool to search what’s exactly wrong with code? You could try validating it, but it depends upon the Theme. Ask the author. Thanks for this amazing tutorial and all the resources. Been trying to learn it myself for quite sometime – but never finding the complete guide. WordPress has definitely come along way since you wrote this post. Creating a theme has gotten easier then coding it from scratch. There is a lot of WYSIWYG wordpress themes out there. For the do-it-yourself type people they can check out the many additional tutorials on making a wordpress website without HTML code knowledge. Great post! Agreed, however, I removed references to the site you mentioned as they are violating the trademark for use of the WordPress domain name. Might want to let them know that they will need to change their domain name in order to avoid possible legal action. I like a lot the design of this site: jocuri de indeminare. Can you guys tell me some other good themes for a website? Sorry, I’m only one person and I do not make WordPress Theme recommendations on this site. There are thousands to choose from in the WordPress Theme Directory and they have the ability now to sort by some tags and styles to narrow down your search. Good luck. I prefer to use Lubith to generate most of the design and layout, that’s because I don’t have that much time to start from scratch, but you gave me really helpful resources in order to further manipulate my editing directly from the code! Great info thanks! Hi Lorelle, I am an italian web designer and i liked very much this post. I’m starting with worpress and you help me! Nice tutorial, i wonder how which of engine is better WP or Joomla. What do you think? There is no thinking about it, honestly. They are both good. They both do similar things, but Joomla servers a small audience of corporate and government sites and services, and WordPress scales across every platform and business and personal site needs. Get the one that best matches your needs and goals now and five years in the future. I really want to be able to create and modify wordpress theme but I recently found out how at your post. Thank you very much for your post today.